Historically high levels of corporate profits might not have to revert to lower levels if the nature of the economy really has changed. 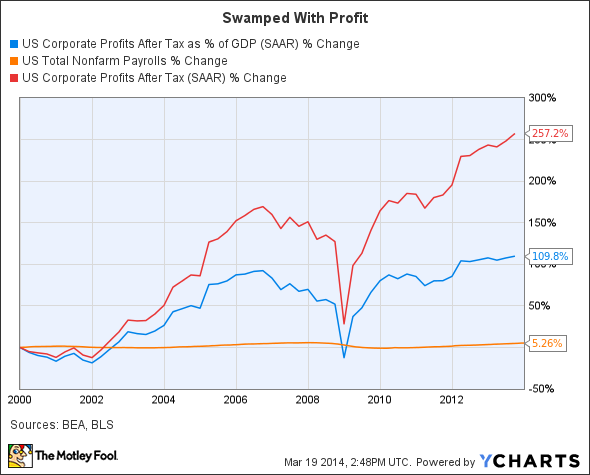 US Corporate Profits After Tax as % of GDP data by YCharts. Note: Microsoft's fiscal year ends in June, Wal-Mart's in January of the following year. * Wal-Mart employee bars are not drawn to scale, but numbers are accurate. In ExxonMobil's (NYSE:XOM) case, all we need to do is to look at the return on capital, which stood at 32.2% in 2006 but which was sliced nearly in half to 17.2% in 2013, to figure out why the company wound up earning less real profit per employee last year than it did prior to the crash. In nominal terms, ExxonMobil was slightly more profitable in 2013 than before the crash -- its reported profit per employee was $371,241 in 2006. General Electric (NYSE:GE) is also easy to explain, as the company was heavily reliant on its financing arm during the subprime years, and it was hurt badly by a wave of defaults during the financial crisis. GE has been paring down its dependence on its finance subsidiary since the crash, and is likely to spin off a big chunk of that segment in a huge IPO later this year. Reduced spending globally on large industrial machinery has also hurt GE. Sources: Corporate 10-K filings and author's calculations. Private sector is nonfarm payrolls less government employment. 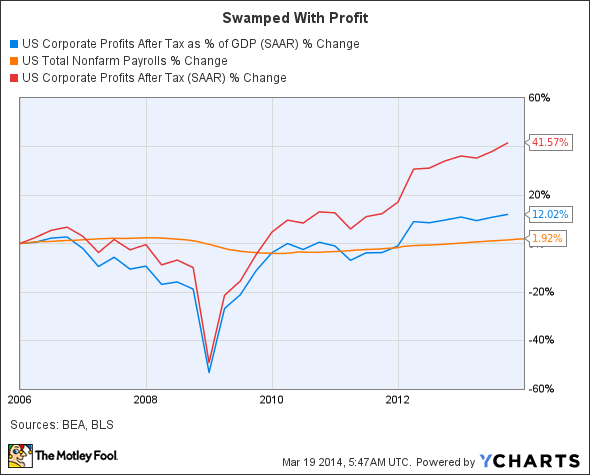 Corporate profits after tax, excluding inventory valuation and capital consumption adjustments. Profits adjusted using Consumer Price Index. Postwar profit per employee remained relatively stable until the turn of the 21st century, when each employee suddenly became much more profitable. Today, the average private-sector worker produces nearly 200% more profit in real terms than he did in fall 2000. Even if we cherry pick the absolute highest points of per-employee profit during the latter half of the 20th century, we find that the average employee is still twice as profitable today as his or her counterpart in 1997, and 70% more profitable than an earlier counterpart was in 1978. Businesses are historically profitable, but they seem to have little trouble handling current levels of customer demand. In the long run, that's bad news for the economy, because it means that fewer people will be needed to make more money. If you want to pinpoint one primary reason for the weakness of the economic recovery, this is it -- fewer people making more money. The largest corporations seem to be picking up the slack created by upstarts that can grow from nothing to a multibillion-dollar profit run rate in less time than it takes to go through medical school, but in the long run they too will probably slim down more drastically than they already have. Businesses no longer need to hire as many people as they once did to meet demand because automation can effectively handle the workload that would have once required additional manpower. You can see how this is playing out in my earlier articles on automation's impact, particularly "The Next Big Unemployment Crisis" and "The Shape of the Future," both of which examine the way work (and life) will change as a result of further automation in the workforce. But here's one easy statistic to consider: Wal-Mart (NYSE:WMT) has by far the largest workforce of the Big Five here, but each employee generated only $7,727 in profit on $213,255 in revenue last year. The combined workforces of Amazon.com (NASDAQ: AMZN), United Parcel Service (NYSE: UPS), and FedEx (NYSE: FDX), which represent the clearest threat to Wal-Mart's continued retail success, generated $258,806 in revenue and $9,222 in profit per employee during the same time frame, and that's in spite of Amazon's well-known aversion to turning a substantial profit. The difference between "old" technology companies and newer ones is even starker -- the value of every one of WhatsApp's employees is more than 100 times greater than the value of one Microsoft's employee, based on its buyout price and on Microsoft's latest market cap. The economy is undoubtedly changing. That might be good for the rare few at the top, but if you can't help create more than twice the profit for your employer than your parents did for theirs, you might find it increasingly difficult to find a good job.